If you would like more information about the modernist techniques, ingredients, and equipment used in the Sous Vide Steak Salad with Honey-Mustard Dressing you can check out the following. This recipe is from our book, Beginning Sous Vide which you can get at Amazon.com. Pre-heat the water bath to 131°F (55°C). Prepare the meat by trimming off any excess fat. Dust the steak with the garlic powder and thyme powder. Salt and pepper the meat then seal in the sous vide pouch and place in the water bath. Let it cook for around 2 hours. 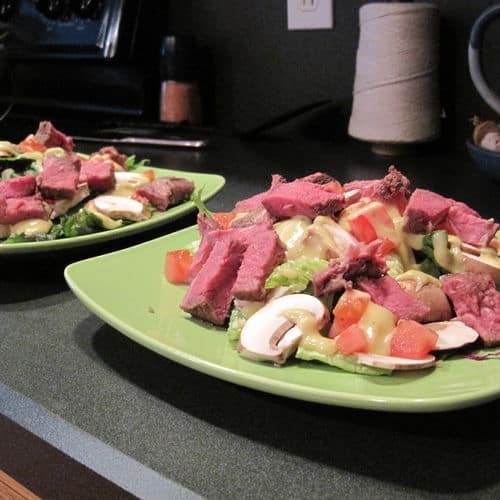 This sous vide steak salad recipe is a different use of the sous vide technique.